Different states and communities in India are currently marking the celebrations for the beginning of their respective New Year. On April 15, as Malayalis mark the festival of Vishu, Bengali people celebrate the Pohela Baisakhi while the Assamese community celebrates Bihu. Each of these festivals sees enthusiastic celebrations from all communities. 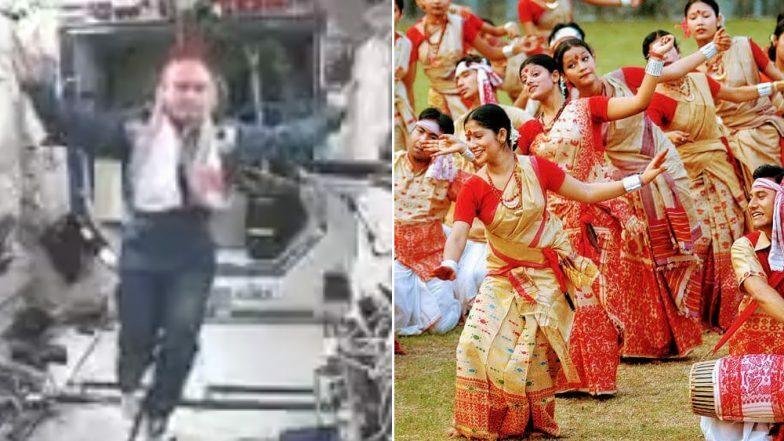 On the day of Bihu 2019, the Assamese new year, an old video has resurfaced on social media which shows an astronaut doing the traditional Bihu dance up in space. In a place of zero gravity, NASA astronaut Mike Fincke had performed the Bihu dance with the traditional Gamucha around his neck. The video is from the year 2004 but it has reshared again on Twitter and people are loving the enthusiasm. Bohag Bihu 2019 Date & Significance: Know History Associated With the Seven-Day Festivity of Rongali Bihu. Mike Fincke shares a special connection with the Assamese culture has his wife is Assamese NRI Renita Saikia. Back then, his traditional Bihu dance in space was shown live by NASA at the annual convention of the Assam Association of North America. It was indeed a special gesture and continues to be even today. So when a journalist shared the video on Twitter on the occasion of Rongali Bihu, it started going viral. Bohag Bihu 2019 Wishes and Messages: WhatsApp Stickers, GIF Images, Quotes & SMS to Send Rongali Bihu and Assamese New Year Greetings. This video is indeed adorable to see Fincke going round and doing the small performance amidst all the zero gravity, not to miss the superb cartwheel. His barely touching the ground of the space station, he is seen enjoying the moment. The video has been viewed over 43,000 times and people are in love with it. First Bihu Performance in Space! The video is a feeling of pride for all the people in the community. Many are impressed by the traditional 'gamucha' or the traditional red and white cloth up in space. This is sure a wonderful way of spreading all the love and happiness of Bihu.